ameliatd (Amelia Thomson-DeVeaux, senior writer): The obstruction findings were a BFD, to me, because I was surprised by how clear Mueller was in suggesting that Trump had corrupt intent when he took various actions around the Russia investigation (such as firing FBI Director James Comey). That was a big deal, for Mueller to paint such a dark picture of Trump and his White House. Mueller essentially told the story of a president who’s willing to intervene in ongoing criminal investigations to serve his own ends, and I wasn’t expecting Mueller to do that so directly. Whether anything will come of that is another question, though, since Mueller himself didn’t actually come to a conclusion on obstruction. That line from the report really stood out to me in contrast to what we’d been hearing from Barr over the past few weeks. perry (Perry Bacon Jr., senior writer): There was a whole, whole lot of obstruction documented here. Like 95 on a scale of 1-100, to me. And it sounds like Mueller didn’t conclude that Trump obstructed justice largely because Justice Department guidelines are viewed as not allowing a president to be charged with a crime. Mueller all but said Trump obstructed repeatedly. ameliatd: There were a lot of things that were pretty different from what we heard from Barr, both in his summary and in his press conference today — it will be interesting to see what happens if Mueller does testify before Congress. I will be curious to hear what he thinks about how Barr handled this. clare.malone: I agree, Amelia. I sort of wonder if he’ll unburden himself in a lawyerly way. ameliatd: I am sure that he’ll do some expert hair-splitting. But still. It will have to be hair-splitting to explain some of the discrepancies between how Barr characterized the report/Mueller’s analysis and what we can read in the actual report. sarahf: Let’s dive into those discrepancies a bit. 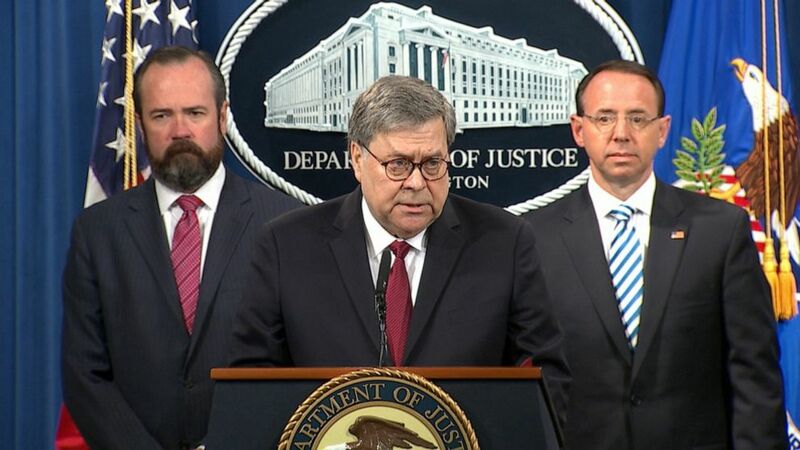 What do we think are the key ways in which Barr’s summary and comments in the press conference on Thursday differed from Mueller’s team’s conclusions? ameliatd: Well, Barr said on Thursday that Mueller’s decision not to come down on obstruction was not driven by an opinion from the Justice Department saying that a sitting president can’t be indicted. And that was important in the wake of the Barr summary because it raised the question — OK, so is Mueller not coming down on this because there just isn’t enough evidence to support obstruction charges?. Reading Mueller’s report, it is very clear that he started from the position that he couldn’t indict the president and then charted his path from there. perry: Barr, to me, implied that Mueller couldn’t reach a conclusion on obstruction, like it was a 50-50 call or something, based on the evidence. It looks like Mueller saw obstruction and the question was should he indict based on that or defer to Congress. clare.malone: I was going to say what Amelia and Perry said. Barr really seemed to have been misleading. perry: Also, Barr in his press conference today implied that Trump was annoyed by the investigation because it was hurting his presidency and the media coverage was bothering him. The report suggests that Trump was worried where the investigation might lead and wanted to stop it by any means necessary. ameliatd: Barr’s summary also seemed to imply that the fact that there wasn’t an underlying crime (i.e., nobody within the Trump campaign was ultimately charged with coordinating with Russia) had an impact on whether Trump could have obstructed justice. Mueller said very pointedly that you can charge obstruction without an underlying crime. perry: Mueller’s team also notes that the collusion/conspiracy/coordination investigation was hampered by Trump allies lying about what happened. clare.malone: More to the Russia side of things, not obstruction? natesilver: But “evidence not sufficient to support criminal charges” is a lot different than “no evidence” or “no effort to coordinate.” For instance, the stuff about former Trump campaign Chairman Paul Manafort sharing internal polling data with Konstantin Kilimnik (a Russian political operative with suspected ties to Russian intelligence) — including the emphasis the Trump campaign would go on to place on Michigan, Wisconsin and Pennsylvania! — isn’t great for Trump. And Mueller isn’t sure what happened to that data, in part because Manafort isn’t a reliable witness so everything about what he did is murky. perry: Right, there is “no evidence to support criminal charges” on the collusion part is just way different than nothing happened. clare.malone: Yeah, especially given the narrow definition that Mueller gave to “collusion.” And we should note that there are a lot of other criminal referrals that came from this investigation, so there’s still some story left to tell. ameliatd: Clare, to your point, it’s also relevant that Mueller focused very narrowly on 2016 election interference. We don’t know what he found and turned over to other investigators. One other big unanswered question on the Russia side: Why were all of these people making false statements about their ties to Russia? natesilver: Maybe because (i) there’s a lot of “smoke,” enough for them to be paranoid even if it all doesn’t amount to a criminal conspiracy to interfere with 2016; and/or (ii) nobody actually is quite sure what happened or what didn’t because the campaign was such a shitshow; and/or (iii) they’re people who lie habitually? And for the most part, the report confirms media reporting, as well as material uncovered in earlier indictments that Mueller issued. ameliatd: I genuinely don’t know, Nate. I think the explanation could be any of the above, all of the above or none of the above. It’s just so puzzling. It’s also puzzling that Trump saw the Russia investigation as such a serious threat, and ultimately we’re left with something that’s not so dramatic. natesilver: The one thing Mueller really seems to go out of his way to bat down is the idea that Russia interfered to change the GOP platform on Ukraine — he seems pretty confident that there’s an innocent-enough explanation for that, which is that Trump had already taken a position on Ukraine on the campaign trail and the campaign/Republicans didn’t want the GOP platform to contradict it. perry: And he also downplays the idea that former Attorney General Jeff Sessions was involved in much of anything during the campaign. natesilver: Yeah, he bats down the Sessions stuff too. clare.malone: One thing that does come across in the report is that a lot of this obstruction stuff was self-inflicted. So, it could be just the idea of Trump being habituated to the “deny, deny, deny” theory of PR. Which, when you’re president, leads you down a pretty dangerous road. Trump going around telling former national security advisor Michael Flynn to get Hillary Clinton’s emails. Donald Trump Jr. and Jared Kushner meeting with Russians to get dirt on Clinton. The various things Manafort was doing that would all look bad for Trump. So all of that stuff in total looks pretty bad. natesilver: For the most part, though, if you were one of those people who, from the Barr memo, characterized the media’s entire Trump-Russia coverage as a gigantic fail … well, the Mueller report itself makes you look pretty dumb. All of the stuff that people were expecting to be in there is pretty much in there. And some of it is reasonably serious! But does it amount to a criminal conspiracy? Mueller thinks not. perry: Like Volume 2 (obstruction) is worse for Trump than Volume 1 (collusion), but if Trump knew most of what is detailed in Volume 1, I can see why he wanted to stop the investigation. clare.malone: Volume 2 just lays out a lot of Keystone Kops scenarios: Trump giving different orders to different people, mismanaged responses to media stories dropping, etc. natesilver: And also, to the extent that his efforts to obstruct the probe were pretty serious, maybe Mueller didn’t find out everything he could have in Volume 1. The report actually says that at some point, and it seems particularly relevant for the Manafort-related stuff. ameliatd: It does seem pretty clear that Mueller was frustrated with his inability to get reliable information out of Manafort. I wonder now that the report is out whether we’ll actually see any pardons. That’s been hanging over the investigation this whole time, and it would actually be unusual, from a historical perspective, if no one implicated in the Mueller investigation ended up being pardoned. natesilver: I mean, that would be a very risky move for the White House politically. ameliatd: Right. There’s a reason why presidents wait until they’re on their way out the door to pardon people. 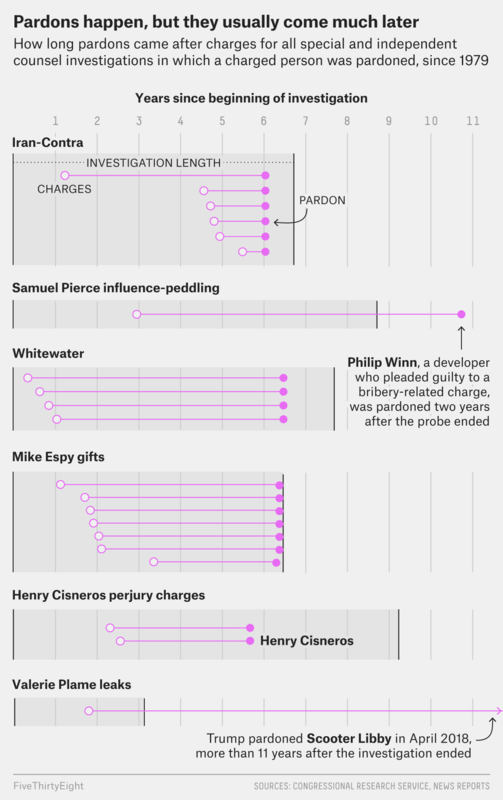 clare.malone: Who do we think the most likely candidates for a pardon are? ameliatd: Maybe someone like George Papadopoulos, who was a relatively minor figure. natesilver: But maybe Trump would do it. You sometimes get the sense that the whole way the White House played it was more to soothe Trump’s ego than to necessarily win the battle of public opinion. The press conference this morning didn’t help the White House at all, I don’t think. perry: Well, the report suggests that Manafort stayed loyal to Trump. But the report also says he was involved in some of the stuff that looks most collusion-like (meeting with Russian officials and discussing poll numbers). Pardoning Manafort would be a really stupid political move. But he might do it anyway. ameliatd: If this report has taught me anything it is that Trump does not think about risk in a way that I understand. clare.malone: I feel like Trump definitely misses the forest for the trees. ALL THE TIME. perry: Well, it appears Trump is always trying to get deputies to actually carry out the legally dubious actions. So I suppose that is smart. sarahf: OK, on the question of obstruction of justice, though, what did we learn that was particularly damning or mischaracterized by Barr’s interpretation that made it a big deal? After all, there were some examples in which Mueller’s team said that the president had the prerogative to, say, fire Comey because it didn’t prevent the FBI from continuing its investigation. But in other instances, Trump was arguably saved from complicated legal issues only because someone in his administration intervened. ameliatd: It would have been huge if Trump had actually managed to fire Mueller. clare.malone: Well, the Comey thing is more complicated, though. It’s within Trump’s power to fire the FBI director, but the way he went about it and the reasons given could tilt it more toward obstruction. perry: The actual activities had been reported — trying to get Mueller fired, firing Comey. But Mueller provided new details that suggest Trump really was behaving in nefarious ways — like deciding to fire Comey but then trying to get Deputy Attorney General Rod Rosenstein to say he came up with the idea is pretty bold. And trying to get former Trump campaign manager Corey Lewandowki to tell Sessions to basically un-recuse himself from the Russia probe and stop parts of the investigation. ameliatd: And Barr was making it seem like maybe the evidence wasn’t there, when in fact Mueller said he couldn’t charge Trump but he could, in theory, clear him of wrongdoing. Then Mueller explicitly said he could not exonerate Trump, which suggests Mueller does think the evidence was at least somewhat compelling. perry: The report shows Trump being deeply involved in the details of trying to stop the investigation and obscure his role in stopping the investigation. ameliatd: Which makes it pretty clear that Mueller found this evidence at the very least compelling, in terms of obstruction. And he didn’t buy arguments from the president’s defenders that Trump couldn’t obstruct justice by firing Comey because it’s one of his constitutional powers, regardless of his motivation. ameliatd: I also just want to note that Mueller said explicitly that a president could be charged with obstruction after leaving office. And Barr just closed that door! natesilver: Are y’all surprised at how wantonly Barr was willing to spin? clare.malone: No, Nate — I guess not? natesilver: I mean, I guess I thought that, say, if the actual report were a 5 out of 10 for Trump (on a scale where 0 is terrible and 10 is great), he’d be willing to spin it to a 6 or a 6.5. Instead he tried to spin it to an 8.
ameliatd: I am surprised, if only because it seemed so ill-advised. Eventually, much of the report was going to go to Congress and the public, right? So why be so misleading? clare.malone: To play to Trump? perry: I think Nate suggested this in the podcast, but the report would have basically met my expectations if it came out pre-Barr’s summary. But the White House took the Barr letter and framed it as an exoneration. So that made the report even more damning — I expected it to be not that bad, and it was, on the merits, really bad for Trump. sarahf: So to that point about expectations — how much of the Mueller report did we already have? ameliatd: I don’t think there’s much of the report that is genuinely new, but there’s a lot we hadn’t heard from Mueller before. natesilver: Let’s keep in mind: If you’re willing to work for Trump — at, frankly, a lot of risk to your reputation and maybe also some legal risk — then maybe you’re a True Believer after all. sarahf: But do we really think this is bad for Trump? For example, what do we think Congress actually does next? Or will it be advantageous for Democrats to use this in 2020? natesilver: It’s not that bad for Trump. It’s a 5 out of 10, relative to pre-Barr letter expectations. But it feels a lot worse because of Barr’s clumsy attempts at spin. Face a struggle between leadership (which has resisted impeachment efforts) and a renewed push to start impeachment hearings. And fundraise off making the full Mueller report available! perry: The report portrays Trump very negatively. And a report can be bad in a legal sense that is separate from its electoral impact. ameliatd: One of the main takeaways for me is that the report has given Democrats ammunition to drag this fight out without necessarily calling for impeachment. Instead, they can call Mueller to testify, call Barr to testify, and use what’s in the report to support more investigations. clare.malone: We’re already seeing Trump campaign emails and videos out today pushing the line that the tables need to be turned and the investigators investigated. We’re already seeing the playbook for how the Mueller report will play out in the campaign: Trump running with the idea that he was persecuted, and Democrats running with the whole “can you believe this guy?” line. natesilver: The report is bad, but it’s roughly in line with what people would have expected, as Amelia and Perry said. Keep in mind that only 42 percent of the public approves of Trump, and that’s in a really good economy! They don’t think he’s honest about Russia or other things. They also didn’t necessarily expect there to be a smoking gun about collusion/conspiracy. The public was way smarter than the media on this stuff, I think. ameliatd: Barr’s little intro to obstruction of justice in the press conference, saying that Trump was facing all of these investigations and scrutiny and there was ultimately no collusion, seems like it will be very useful for Trump and his defenders. “Based on what we have seen to date, going forward on impeachment is not worthwhile at this point. Very frankly, there is an election in 18 months and the American people will make a judgement,” House Majority Leader Steny Hoyer told @DanaBashCNN . natesilver: But Hoyer is right on the politics of this. Impeachment is not a popular option. As Amelia said, call Mueller to testify. Call Barr to testify. Call other people to testify. So you can have a drip, drip, drip against Trump, mostly to satisfy partisans and keep him off balance. But impeachment? Not popular. clare.malone: The ultimate “Twitter is not the Democratic base” stance! natesilver: It’s also Trump’s first term. The Nixon/Clinton impeachment efforts both came in the second term, when those presidents were lame ducks and there wasn’t any recourse from the public. ameliatd: I’m not sure this gives Democrats much fodder for more investigations because the obstruction stuff was so clear and there don’t seem to be many more avenues to explore the 2016 election. Maybe it helps them get momentum to look into Trump’s finances for ties to Russia? natesilver: Also, if Trump were unpopular enough that he could be not only impeached but also removed by the Senate — which would mean that his approval rating with Republicans would have to be way down — wouldn’t you rather run against him anyway? That would probably imply he had like a 29 percent approval rating or something, in which case the Democratic nominee in 2020 would be on track to win in an epic landslide and maybe pick up some huge congressional majorities too. clare.malone: But what does it take for him to slide to that point? And is that a realistic expectation given our political environment, Nate? That just seems to be a pretty unlikely thing to happen. natesilver: No, I’m not saying that at all. I’m saying that impeachment won’t actually result in his removal from office unless he’s fallen to like 30 percent. But if he’s fallen to 30 percent, Democrats don’t want to impeach him because then they’re basically guaranteed a landslide victory in 2020! ameliatd: And if they impeach him, they risk turning him into a martyr. sarahf: OK, to wrap … We have the report. And the evidence that Mueller had on the question of obstruction justice was a bigger deal than Barr indicated in his initial summary. But what does the report’s release actually change? Is it a question of who wins the political narrative? ameliatd: This is the tricky thing about special counsel investigations! If they don’t come to a conclusive result, it’s hard to know what to do with the findings politically. clare.malone: Basically, Democrats have to keep their base on board with the long-term plan of winning back the White House and not the short-term impulse to impeach. perry: The question, I think, that is on the table is: What is the non-impeachment remedy for a president who appears to be at least somewhat open to violating norms and/or laws? natesilver: What does it change going forward? I dunno. The Barr memo didn’t do much to shift public opinion in Trump’s favor, so Occam’s razor is that the Mueller report won’t do much to shift public opinion against him. I do think it will make the press more skeptical of Barr and any efforts the White House makes to normalize its conduct. ameliatd: And it does mean we’re going to keep hearing about the investigation, which could be good for Democrats because people are so fired up about it. natesilver: It certainly describes a White House and a campaign that’s in total disarray. In the end, as Perry said earlier, I think it brings us back to where we were a month ago, where “the Russia stuff” is a negative for Trump and one of the reasons his approval rating is so low but not an acute crisis for him or the first (or second or third or fourth) thing that voters are thinking about. City is out, but the favorites to win the whole thing still hail from Northern England. According to our SPI, Liverpool has the best chance to conquer Europe. The Reds followed up their very professional 2-0 win over Porto at Anfield last week with a very professional 4-1 win over Porto at Estadio de Dragao on Wednesday. Porto needed to score at least two goals to send the series to extra time — and at least three to win it outright — and the first 35 minutes of the match reflected that: Porto completed twice as many passes in the attacking third as did its opponents from Merseyside en route to outshooting them 14 to 3. But then Liverpool scored a goal in the 26th minute, and it was all but in the bag for Jurgen Klopp’s side. Eder Militao, future center back for Real Madrid, scored a late goal for Porto, but it was merely consolation. And Liverpool’s reward for its 6-1 aggregate victory? A date with Barcelona in the semifinals. Speaking of the Catalonians, they made relatively light work of Manchester United in the quarterfinals on Tuesday. Lionel Messi did Lionel Messi things at Camp Nou, scoring twice from outside the box — one shot with his left foot, the other with his weaker right — in a matter of four minutes. The first was vintage Messi, a left-footed effort driven low that curled past the outstretched body of Manchester United goalkeeper David de Gea and into the bottom left corner of the goal. The second was less spectacular, a speculative effort that de Gea whiffed on uncharacteristically. Gift or not, the goal put Messi two clear at the top of the Champions League Golden Boot race. A goal in the 61st minute from old United foe Philippe Coutinho put the series out of reach for the Mancs. And now the soccer world can salivate over a Messi-vs.-Salah showdown in the semifinals. If the result in Barcelona felt like a forgone conclusion, the result in Turin felt like anything but. Ajax’s 2-1 Tuesday win (3-2 aggregate) marked a sort of long-fermented revenge: In April 1997, the last time the Dutch giants played in the Champions League semifinals — a month before the team’s current best player, Frenkie de Jong, was born — they were eviscerated by Juventus, losing by an aggregate score of 6-2. That Ajax team featured club and country legends Edwin van der Sar, Frank de Boer, Marc Overmars and Danny Blind,2 but Lucky Ajax wasn’t very lucky on that occasion. This time around, Ajax took the game to Juventus from the opening whistle, a strategy that should have stunned exactly no one who watched the team embarrass Real Madrid last month. Total shots and shots on target were nearly equal Tuesday in Turin, but Ajax created more big chances and completed a higher percentage of passes in the attacking third than Juventus. Crucially, the Dutchmen didn’t panic when Cristiano Ronaldo scored to give the Italians the lead in the 28th minute. They kept pressing, kept playing on the front foot, and midfielder Donny van de Beek bagged an equalizer just six minutes later. And even after it took the lead on a header from team captain Matthijs de Ligt in the 67th minute, Ajax didn’t sit back. The side smelled blood and attempted more passes inside the penalty area in the final 23 minutes plus stoppage time than its opponents. Ajax could have scored a couple more — and now it has a 16 percent chance in our SPI model to win the whole thing, up significantly from before the quarterfinal’s second leg. It’s hard to predict whether Ajax pups like de Jong, de Ligt and van de Beek will go on to have the kinds of long, fruitful careers their elder countrymen did, but there’s little doubt that they’ve cemented themselves as club legends. They’ve made Ajax relevant again. Now all that’s left for them to do is to make Ajax champions again. Democratic hopefuls have two ways of getting onto the debate stage, according to a February news release from the Democratic National Committee. They can earn at least 1 percent of the vote in three different national or early-state polls conducted by qualifying pollsters, or they can receive donations from at least 65,000 unique donors, with at least 200 individual donors in at least 20 different states. And as you can see in the table below, of the 16 major candidates FiveThirtyEight is tracking — plus former Vice President Joe Biden, who hasn’t yet entered the race but is widely expected to — 15 have already met at least one of those two criteria, according to our research. Which candidates have made the primary debates? Includes candidates deemed “major” by FiveThirtyEight and Joe Biden, who has not formally entered the race. To qualify via polling, a candidate must reach 1 percent in at least three national or early-state polls from qualifying polling organizations. To qualify via donors, a candidate must have at least 65,000 unique donors with at least 200 donors in at least 20 different states. Whether a candidate has hit the donor threshold is based on information released by campaigns. Of the major candidates we’re tracking, only U.S. Reps. Tim Ryan of Ohio and Eric Swalwell of California have not yet qualified, but working in their favor is that they announced their campaigns in the past two weeks. Also considering that they both received 1 percent in a recent Iowa poll by Monmouth University (one of the qualifying pollsters), it’s not implausible that they could hit that mark in two more qualifying polls by early June, ahead of the first debate. And remember that our tally above doesn’t include 2020 hopefuls whom FiveThirtyEight doesn’t consider “major.” Some of those candidates, including author Marianne Williamson, Miramar, Florida, Mayor Wayne Messam and retired Alaska Sen. Mike Gravel, could end up qualifying for the debates, as could candidates who have up to now been pondering a run but end up getting into the race in the next couple of months. Colorado Sen. Michael Bennet, Montana Gov. Steve Bullock and New York Mayor Bill de Blasio, for example, have not officially declared their candidacies, but each has already received 1 percent in at least one qualifying poll. So the number of candidates meeting the criteria to participate in the first debates could grow. This means we could end up in a situation in which more than 20 candidates qualify to participate in the first debate. The Democratic National Committee indicated in its release that it will cap the debate at 20 candidates and that if more than 20 qualify, the candidates who meet both thresholds will be given preference. Based on our tally, which relies on self-reported figures, six currently do.10 But we don’t have a complete picture of who has met the donor criteria. (The DNC said in its release that candidates will be required to provide evidence of how many donors they’ve had.) So, theoretically, we could end up with more than 20 candidates who hit both marks. What happens then? The party indicated in the release that it would then give debate spots to the candidates with the highest polling averages. So let’s suppose that the DNC needs to create a polling average to narrow the field to 20 participants — where do the candidates fall currently? Since late February, there have been four qualifying national surveys and three early-state polls (two from Iowa and one from New Hampshire).11 If we average these polls together, we can get a sense of how a polling average might help some candidates — and not others. As you can see in the table below, only eight candidates are polling above 2 percent, on average. Combined average based on four national polls, two Iowa polls and one New Hampshire poll. Seven candidates are polling at less than 1 percent, which could signal that they might be in trouble if the polling average comes into play. Granted, if there are more than 20 qualifiers by June, there will be more polls to include, which could boost — or hurt — a candidate’s standing. Not to mention that it’s unclear how the DNC would calculate a candidate’s polling average. FiveThirtyEight reached out for clarification, but the DNC wouldn’t specify how it would handle such a situation. If the polling averages aren’t enough — and the DNC has need for further tie-breakers to determine a final list of debaters — it said in its release that the number of “unique donors” would be taken into consideration (although it declined to specify how this would work). It’s no wonder then that candidates are also very focused on increasing their total number of donors. For example, former Maryland Rep. John Delaney is trying to hit the donor threshold by promising to donate $2 to charity every time someone new donates to him. His campaign said Delaney’s “debate challenge” will remain in place until he has 100,000 new donors, which could help him in the event of a tie-breaker. Time will tell, but Democrats could very well have more than 20 candidates qualify for the debates. And if that happens, get ready for a debate about the debates, similar to what Republicans experienced in the 2016 presidential cycle. Latinos became the nation’s largest minority group in the early 2000s. Next year, the country’s pool of eligible voters is expected to include more Latinos than African Americans for the first time. But more than 10 years after black voters proved pivotal in nominating and electing the first African American major party presidential candidate, a Latino candidate has never come particularly close to winning the Democratic or Republican presidential primaries. Julian Castro, of course, hopes to change that. So far though, he’s polling in the low single digits. Whether it’s Castro or another candidate in another election cycle, will Latino Democrats mobilize behind electing one of their own for president, as black Democrats have in the past? Before we get to Castro, let’s start with understanding the role of the Latino vote in the Democratic primary process. While the eligible voter pool is expected to include more potential Latino voters then black voters in the 2020 general election, black voters are still likely to outnumber Latino ones in the Democratic primary. That’s true for several reasons, most notably because African Americans tend to vote at higher percentages and because Latinos are more divided between parties (about 25 percent are Republican and about 60 percent are Democrats) than African Americans are (close to 90 percent are Democrats). So part of the reason media coverage of the 2020 Democratic primary, including the coverage at FiveThirtyEight, tends to emphasize the role of black voters more than Latino voters is simply that there will likely be more black voters in the primary. 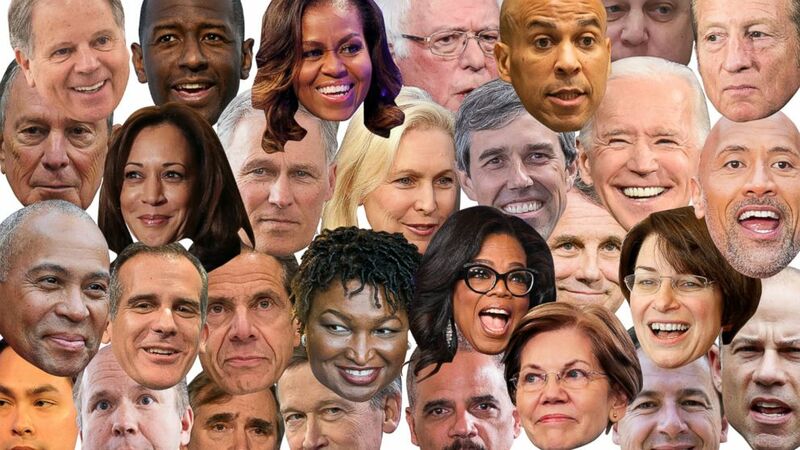 As a rough estimate, I would expect somewhere from 18-25 percent of Democratic primary voters in 2020 to be black and 10-20 percent to be Latino. But the size of the black vote is not the only reason it’s important in the primary — black Democrats also sometimes vote as a big, unified bloc. In four modern, competitive Democratic primaries, black voters overwhelmingly got behind one candidate — Jesse Jackson in 1984 and 1988, Barack Obama in 2008 and Hillary Clinton in 2016 — with more than 75 percent of the African American voters backing a single candidate, according to exit polls. The Latino vote, in contrast, has tended to be less unified, regardless of whether a Latino candidate was on the ballot. The most prominent Latino Democrat to run for president was then-New Mexico Gov. Bill Richardson in 2008. He dropped out after lackluster finishes in Iowa and New Hampshire, so his campaign didn’t last long enough to compete in states with large Latino populations. The overall Latino vote is much smaller on the GOP side, but neither Sen. Ted Cruz of Texas nor Sen. Marco Rubio of Florida did particularly well in 2016 with Latino voters in any of the three states where we have detailed exit poll results — each won a plurality of the Latino vote in their home states, but President Trump won at least a quarter of Hispanic voters in both Florida and Texas and a plurality in Nevada. The candidate who has done best with Latino voters in recent primaries is Hillary Clinton, but even her performance was not dominant. In 2008, Clinton won more than 60 percent of the Latino vote in the Democratic primary. In 2016, few exit polls were conducted in states with sizable Latino populations,1 but of the four states where we do have detailed results, Clinton basically split the Latino vote in Illinois and Nevada against Bernie Sanders, while winning about 70 percent in Florida and Texas. What does all this history mean for Castro’s candidacy? Castro, who served as mayor of San Antonio from 2009 to 2014 and then as secretary of Housing and Urban Development in the Obama administration, is not a civil rights leader in the mold of Jackson or an already famous political figure like Clinton. But you could see him taking a path somewhat similar to another Harvard Law School graduate who ran for president in his 40s: Barack Obama. In 2007, before the voting began, polls suggested that Clinton and Obama were running neck-and-neck among black voters. Then, Obama won Iowa and narrowly lost New Hampshire, two states with very small black populations. Once the primary moved to the South, Obama overwhelmingly won the black vote. It’s impossible to know for sure, but it seems likely that black voters moved decisively toward Obama as they saw that he had a real chance to win. And that black support helped Obama win many Southern states, including a number with heavily black Democratic electorates. In short, Castro will have less time, post-Iowa, to show Latino voters he has a real chance. That means he’ll need to use Iowa and New Hampshire as a springboard as much as possible, while also trying to rally Latino voters for strong showings in Nevada, California and Texas regardless of what happens in the first two contests. And it’s entirely possible that he will succeed in mobilizing Latino voters. Some research has shown Latino voters are more likely to vote if a Latino candidate is on the ballot and more likely to back the Latino candidate than a white one, even in an intra-party race. But that research largely looked at state- and city-level races — we haven’t had a major Latino presidential candidate on the Democratic side, where appeals to shared racial identity are easier to make than in the GOP. “If Latinos think that Castro has a reasonable chance of winning, they will come out in large numbers to support him,” said Melissa Michelson, a political science professor at Menlo College and an expert on Latino political activism. She suggested having key Latino leaders embracing Castro’s candidacy would be important, with Michelson specifically naming journalist Jorge Ramos as a key potential validator for Castro. Michelson’s caveat — “a reasonable chance of winning” — is important and goes back to the Obama comparison. Castro is currently polling at 1 percent in many surveys. He is raising significantly less money than some of his rivals, and it will take a lot of money to organize and win in big states like California and Texas. There are few polls that have large samples of Latino Democrats, but the fact that, in the few polls available, he’s not doing much better in California (where 30 percent of eligible voters are Latino) than in Iowa (where 3 percent of eligible voters are Latino) suggests that he is not overwhelmingly popular with that demographic. For Castro to even test the potential for a Latino candidate to mobilize Latino voters in a Democratic primary, he needs to first do fairly well in contexts where Latino voters are not particularly powerful: fundraising, endorsements and debates. Castro is an experienced politician, and he seems to know all of this. He is running a campaign not unlike Obama’s in 2008 or Cory Booker’s and Kamala Harris’s this year — some targeted appeals to his racial group but also a traditional campaign aimed at the broader Democratic base. I spent a day on the campaign trail with Castro last month in and around Charleston, South Carolina. Castro started the day visiting a black church, then went to the site where a black history museum is being built and later to a barber shop. In short, the former mayor was campaigning for the black vote, just as all the other presidential candidates do when they go to South Carolina, where African Americans are likely to be the party’s biggest voting bloc. He doesn’t want to be narrowly defined as the Latino candidate and realizes he can’t be defined that way if he wants to win. At the same time, Castro, who is Mexican American, went to Puerto Rico in January for his first major trip after launching his campaign. His staffers are trying to organize the relatively small (6 percent) Latino population in Iowa and get them excited about Castro. He has called for a “Marshall Plan for Central America,” referring to the aid that the United States offered to help rebuild Europe after World War II. 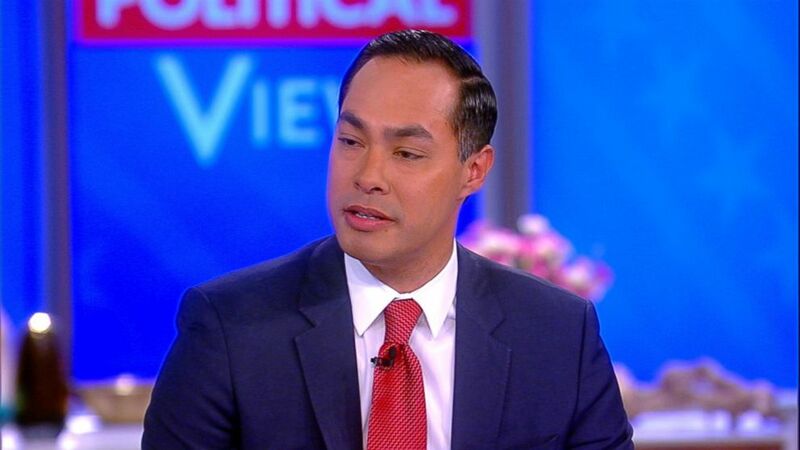 Castro is one of the few Democratic candidates to put out a comprehensive immigration proposal, with a group of proposals that would add up to a total reversal of the aggressive border security regime that has existed not only under Trump but also Obama and George W. Bush. He is not shying away from issues that disproportionately affect Latinos and could cast him as defending Latino interests. When I asked Castro how he would present himself as “electable” to Democratic voters, he named six states that he felt he could flip: Michigan, Pennsylvania and Wisconsin, which Clinton barely lost in 2016, along with Arizona, Florida and Texas. Castro didn’t outright say this, but the implication was obvious: Arizona, Florida and Texas are the three states with the largest Latino electorates that did not vote for Democrats in 2016. Castro is doing exactly what he should be doing at this stage — trying to make himself a viable candidate to all Democrats while also laying the groundwork for Latino voters in particular to get behind him. But he probably has to be great at the first part to get a chance at the second part. And so far, the signs are not promising. The first time Tiger Woods won the Masters, becoming the youngest to ever do it, he decimated the field and crumbled in his father’s arms. “We made it,” Earl Woods told his then-21-year-old son. Woods is now 43-going-on-60, still donning his trademark Sunday red. He scaled Augusta National this weekend for the fifth time,1 holding off a number of contenders, some of whom grew up watching him transcend the sport, on the back nine. What once seemed inevitable was anything but just a few years ago, as Woods battled surgeries and off-the-course maladies. “Maybe the son of golf has returned,” broadcaster and former Masters champion Nick Faldo said as Woods left the 17th green. It had been 3,954 days since Woods last won a major. Somehow, it felt even longer. Winning a major is an accomplishment reserved for a select few, but for a 10-year span beginning in the late 1990s, it was as synonymous with Woods as audacious drives and timely putts. This didn’t come out of nowhere. Bettors knew there were signs that he was putting it all back together. But it was also known that this might have been the best remaining shot he had at summiting Augusta. Suddenly a man who went five years without a win on tour has two in the past seven months. His turn-back-the-clock performance materialized when it mattered most. He now has three top-10s in his past four majors. He did it by playing Amen Corner at one-under on the final day, while the other two members of the final pairing played it one–over. Just as he has previously, Woods bashed the par-5s (-8), going three-under on them over the final round. He approached the 15th hole in a three-way tie with Xander Schauffele and Francesco Molinari, detonated his tee shot and immediately began walking toward the hole as it soared through the sky. He two-putted his way to a birdie and an outright lead and never looked back. The last time Woods won the Masters, his chip-in on the No. 16 green provided the signature highlight of his career. Playing the same hole 14 years later, Woods added to his legend. He struck an 8-iron to the center of the green, spinning it back down the hill where it stopped 4 feet from the pin. As pandemonium played around Woods at the tee box, a replay showed him at-ease cooing “come on” to his ball at it inched closer to history. That wasn’t the only time precision paid off for Woods on par-3s, which he played four-under for the tournament, the best four-round score among his five wins. When Molinari and Tony Finau found the water on No. 12, it was Woods who found the green and two-putted his way to par. Nine players entered the weekend within a shot of the lead, the most in Masters history. That historically congested scoreboard continued Sunday, as each hole seemed to carry implications for the top 15 in the standings. The win marked the first time Woods came from behind in the final round to win a major. Most unbelievable was the winding path Woods had to take just to get back to Butler Cabin. His career first began to go off the rails with a knee injury that cost him half of the 2008 season, and although he played well in 2009 (leading the PGA Tour in money won), he also blew a Sunday major lead for the first time ever when Y.E. Yang overtook him at the PGA Championship. Then came The Accident, which brought to light an ongoing pattern of behavior that tore apart Woods’s personal life. Even that may not have been the low point, however. Woods only dropped to 52nd in the World during his post-scandal struggles — and eventually fought back to reclaim the No. 1 ranking in 2013, winning five events and once again taking the money title. 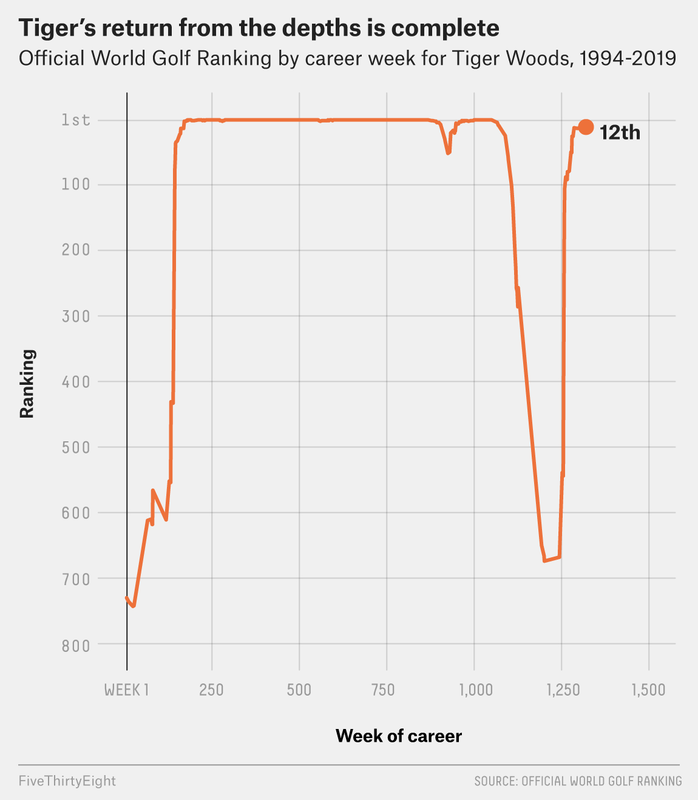 But in the years that followed, Woods would play so poorly and infrequently that he dropped to 674th in the world in early 2017. Such a pronounced valley in performance (particularly relative to the rest of his career) led plenty of pundits to write off Woods’s chances of ever winning another major. Those takes look scorching hot in retrospect, but it’s difficult to find an established veteran player whose ranking dropped outside the top 600 and who managed to claw back to win a major. Then again, Woods is one of the greatest pure talents in golf history — if anyone was going to rewrite that record book and make such an astonishing comeback, it would be him. Age comes for everyone, of course. And the aging curve for golfers heads south well before 45, which will be here for Woods in no time. But even as younger players increasingly dominate the sport, there’s still room for perhaps the greatest golfer of all time to enhance his legacy. Golf’s prodigal son has officially returned, and what happens next is not known. But no one will again underestimate what Tiger Woods is capable of on a golf course.